For 14 years now, we have invited Gold Star families to gather at the Marines' Memorial Club for two days in February. Here, they find mutual support, a place to share sweet memories, and some comfort amid their grief. You can support our Gold Star families by attending the memorial service on 22 February and by making a donation to this year's Annual Gold Star Parents Honor and Remembrance event. Thank you. Bring the family for a viewing party at Marines' Memorial! Enjoy a tailgate-style buffet, cash bar, games and prizes. Tickets include 2 drink tickets and snacks, and admission is free for those 16 years and younger. Doors open at 2:30 p.m. Call (415) 673-6672 and ask about our special room package. MEET THE AUTHOR THURSDAY 7 FEBRUARY, 6:30 p.m.
"War is knowable," writes National Defense University strategy professor Sean McFate, "and half of winning is knowing what it looks like." Join us at World Affairs, 312 Sutter St., Ste. 200 for a critical look at why the US struggles to win wars and what we can do about it. 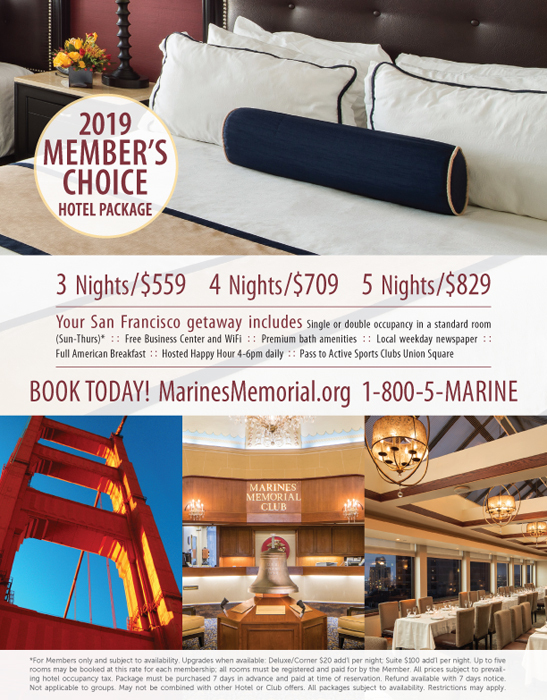 MEMBERS USE CODE: MARINE2019. COMMEMORATION FRIDAY 22 FEBRUARY, 9 a.m. The Marines' Memorial's 14th annual Gold Star Parents Honor and Remembrance event benefits parents whose children were killed while serving the US Armed Forces. Please join us for this special memorial service in the Marines' Memorial Theatre. HOLIDAY SUNDAY 17 MARCH, 4 p.m.
Join the shenanigans in the Leatherneck Steakhouse! Come be Irish with us as we eat, drink, and dance the evening away to the music of the Spinheads. Tickets include 2 drink tickets and corned beef and cabbage buffet. A cash bar will also be available. SPEAKER EVENT THURSDAY 28 MARCH, 6 p.m.
Battlefields to Ballfields provides Veterans an opportunity to integrate back into their communities through football officiating and scholarships - and they're looking for Veteran candidates! Join us as Fox Sports analyst and former NFL referee Mike Pereira describes this unique and important program. GEORGE P. SHULTZ LECTURE WEDNESDAY 24 APRIL, 5:30 p.m.
Our popular George P. Shultz Lecture Series continues with a presentation from former National Security Advisor H.R. McMaster. LTG McMaster will shed light on his experiences in military and government service. Reserve your tickets today, and enter code MMA to receive member pricing. A scintillating conversation on the ancient principles of democracy, oligarchy, and dictatorship; on the Roman Republic experiment and its failure of Empire; on the implications of Ancient Greece and Rome for American intellectual life and its representative democracy… and more. Iconic images like the Mona Lisa, The Last Supper, and the Vitruvian Man, along with scientific drawings and inventions far ahead of their time, are only the best known of Leonardo de Vinci's contributions. Join Humanities West in exploring his vast achievement and his interaction with the world that shaped him. The Flying Leatherneck Lounge on the Club's 2nd floor is a great place to run into old friends and meet new ones. If you're staying here, Happy Hour is complimentary. Why not stop in this week? We look forward to seeing you! For 15 years, the MarineClub Bullies have spread goodwill and cheer as the loveable mascots and official canine ambassadors of the Marines' Memorial Club. Continue the tradition with a guaranteed smile by sending these assorted notecards to friends and family! Boxed in sets of 8 cards/envelopes. Wedding on a Budget? We can do that. Introducing the Skyline Wedding Package. Available Sunday and Monday evenings only, your all-inclusive celebration takes place on the Club's 12th floor, with stunning views, expert event coordination, exceptional service, and gourmet catering. Only $89 per person (50-90 guests).